I really need some help. I was born and raised catholic until the age of 12. Even as a small child, I questioned a lot of the rituals, but wanted to be a good kid, so I went along with a lot of it. I finally got frustrated with having to confess to a priest, and left the religion. Around this time, the Omen movie came out, and scared me really bad. My Mom scared me even more by showing me the scriptures in Revelation that talked about the things in this movie. I was horrified, and prayed every day that God would not end the world. I was a very serious child, worrying about WW III, Communism, etc. so this fit right in for me!! When I was 13, my mom had to have surgery, so I ended up staying with one of her co-workers for a week. She and her husband ended up being fundamentalists, and I ended up having to sit through a bible study at their house, on--you guessed it-- the end times!! 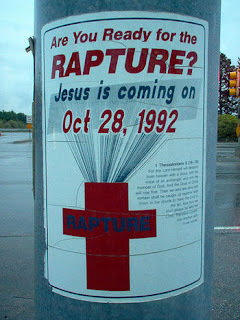 Again, I was scared to death, but listened to everything that they said and was intrigued by the rapture and the possibility of escaping all of this horrible stuff. I quickly converted to their religion and tried to stay holy. After a couple years, I started to dread going to church because I hated the end-time preaching. It just continued to scare me and left me feeling horrible about all of the people going to hell-- including my own friends and family. I also thought that a lot of the preaching seemed to be incorrect-- things that preachers said were going to happen did not, etc. After a while, I finally had enough, and even discovered a few scriptures where Jesus had told his apostles that they would not taste death, etc. I tried to meet with a pastor to discuss my fears of the end-times and confusion with some of the things that I had found in the bible, and his response to me was to see a psychiatrist. I left the church that day in 1990 and have never been back. I have done a really good job, occasionally freaking out when I hear rumors of temples being rebuilt in Israel (one of the big end-time things! ), or some other end-time trigger In the mean time, I tried to live my life not worrying about end-times stuff. I have done a really good job, occasionally freaking out when I hear rumors of temples being rebuilt in Israel (one of the big end-time things! ), or some other end-time trigger, but have been able to reason through everything. However, a year or so ago, a "friend" sent me an email about a microchip implant-- and how it tied to the mark of the beast. It triggered my fears all over again. I don't believe in God at this point, and I feel like I should not even be worrying about the end of the world, but I have a hard time with this one-- I have researched all of the information about the email, and found that there is a company that had marketed a medical microchip that you could put in your arm, and there had been a few test cases of using it for paying for drinks at one bar-- but for the most part, folks were not generally interested. It appears that the company now plans to develop their microchips for glucose-monitoring,etc. That being said, I know that technology could eventually lead us in a direction in which people could possibly put something in our bodies in order to conduct business, etc. I have a harder time with reconciling things like this, only because one of the biggest end-times subjects was a cashless society, and human bar-coding. I would love not to have to even worry about all of this-- I would be fine with cash, checkbooks, etc. for the rest of my life, or even using a fingerprint as some sort of ID, but now all of the end-timers have jumped onto the microchip bandwagon. I keep telling myself that as long as I don't put that damn chip in my right hand or forehead, I should be OK, but I still get scared. I also have read all of the material on the MOB itself, and that more than likely was a reference to Nero, etc. but I still worry. I have always been such a worry wart, and what could be bigger to worry about than the end-times!! I really want to spend the rest of my life enjoying time with my husband and children, watching them grow up and have kids of their own. A couple of years ago, I thought this was a possibility. Now I find myself back in that weird world of fear-- worrying about the end of the world all over again. How do all of you cope with this?